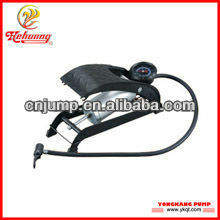 This single barrel foot pump is easy to operate giving you clear and accurate tyre pressure reading PSI and BAR. It has a long reinforced hose attachment which fits most tyres. Clearly with it's non-slip rubber foot pedal it reduces the possibility of slipping while applying pressure to your tyres. If you are interested in our porducts,pls don't hesitate to contact with us!